The high geothermal energy and the production of electricity from steam. Geothermal energy is a well-known for its use as a heating and less for its electricity production. This is unfortunate because it has many strengths to produce megawatts of electricity without fuel, low-cost and cleanly. The heat of the earth's heat is used since ancient times, but the high geothermal energy, which produces electricity, there is only since the beginning of the preceding century. Before the men were content to use the hot springs or, more rarely pressure water geysers or fumaroles they used for heating, cooking food and baths. The first product to have an electric current from geothermal is Ginori Conti in 1904 in Larderello (Italy). The unique geology of this site is known for its geothermal sources and volcanic activity since Roman times. This is the USA, exactly pus in California in 1960, the first major geothermal plant is built. It has a capacity of 11 megawatts, although a smaller facility had already been built in the USA in 1921 with a capacity of 250 KW, it was not sufficiently profitable. In 1970, the Geothermal Resources Council is created, it is a grouping of professionals geothermal. In California, from 1987 to 1989, the largest geothermal plant in the world is built. The geyser reaches maximum capacity MegaWatt today it has a capacity of 750 MW. During the first and second oil crisis, geothermal is experiencing its first wave of exploration and drilling large. It then fell into disuse with the fall in the price of a barrel of oil. She returned to the fore today with the energy concerns and problems related to pollution. Italy and the USA are the two players historic geothermal, they still retain an important role in the production of geothermal electricity. Italy is the 5th largest producer in the U.S. as they are the world's largest producer with more than 2,500 megawatts of power production. Between the USA and Italy are the Philippines, Indonesia and Mexico. The two volcanic islands such as Iceland and New Zealand are behind Italy in terms of geothermal. 1. Geothermal energy low (below 100 degrees) that simply allows the thermal heating. 2. The average geothermal energy used to heat apartment buildings in urban areas as in Reykjavik (Iceland), the heating of greenhouses and fish farming. 3. The high geothermal energy (high temperature, above 100 degrees), it is used to produce electricity from steam. The geothermal system that interests us is not that of your neighbor's house, but the geothermal energy that can supply electricity to tens of thousands of houses like the neighbor. Geothermal energy uses high heat from the earth to produce steam, which turns a turbine. From a generator, electricity is produced. The cooled water is then returned to the basement to renew the water and then be heated to high temperature above 100 degrees. The main advantage of geothermal is to have a production cost of Mega Watt electricity extremely low. The low production cost allows MégaWatt geothermics to be leaders in energy shoulder to shoulder with the most profitable of hydropower, wind and even coal, oil, to gas and nuclear power. Geothermal facilities can be installed anywhere, there must be suitable sites for the heat that is closer to the surface of the earth's crust. This avoids costly drilling for achieving the hot water tanks. In this area, the U.S. geothermal energy are that Saudi Arabia is to oil, the first in the world in terms of capacity development, technology and investment. There are now on the west coast of the USA is looking for investments in this sector and a political will that will very likely increase with the new president. The approach of peak oil and the need to fight against pollution sweeping the world of energy. Fossil fuels (gas, coal) and uranium become more attractive with rising oil prices. In this context, renewable energy, also called green energy, become even more interesting by their lack of fuel consumption and emissions limited. The viability of the industrial production of geothermal power is proven for 50 years, but its technical features make it a little rest in the shade of other renewables, this should not last forever. Untapped geothermal resources are enormous, but their distribution in the Earth's surface is uneven. They are most often the major seismic faults in the earth's crust where they are located in volcanic regions. Thus some regions of the world are naturally advantaged, they should sooner or later become aware of the huge advantage they can get their basement with electricity produced by geothermal energy. 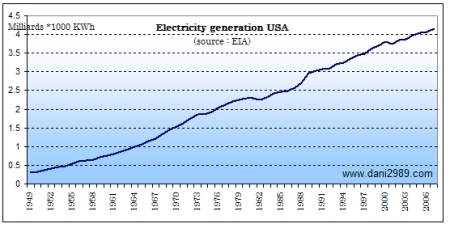 Here is the graph of electricity in the U.S. since 1949, notice the regularity of growth, only if we manage to detect the presence of first and second oil shock. Geothermal energy produces clean electricity at low cost, on a global peak oil production, world demand for electricity constantly increasing, the fight against pollution and energy independence. Geothermics therefore has many advantages. The next wave of rising energy goes, as the previous one, be good for geothermal and I think the time has come to focus on this sector in both defensive and full of promise. For those who want more pay a report of 26 pages is available with more details and a selection of geothermal companies.